Home Business Commentary Civil Rights, Really? 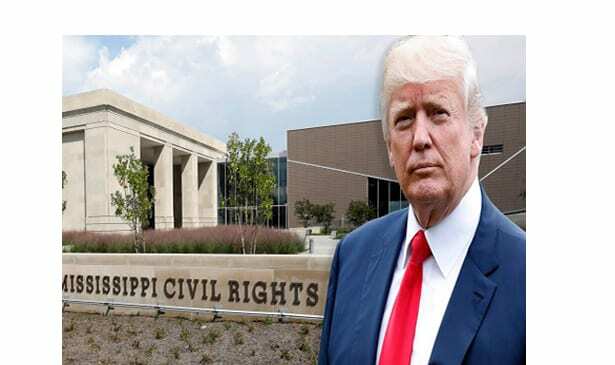 Last week, President Trump made a speech in the opening of the Mississippi Civil Rights Museum in Jackson Mississippi. Normally, a visit from a sitting United States President would be considered appropriate. However, this president who has been so decisive and has yet to unite Americans on any civil rights issues. Mississippi is home to some of the greatest leaders of the 20th century. Medgar Evers, Fannie Lou Hamer and James Merideth are some I bet he knows little or nothing about. The President’s actions against civil rights since his “election,” leaves most to believe he doesn’t know or care about the purpose of this museum. Let’s look at some ways this president has refused to support civil rights he has said he is a supporter of. First, he has attacked the voting rights of all Americans. He and his administration have waged war with a national voter suppression campaign. This was done by pushing to defund the Election Assistance Commission. They have also encouraged the spread of the myth of voter fraud and have asked each state to remove voters from rolls and to enact other suppressive policies. Contrary to his actions, the civil rights leaders in the museum fought for the right of all Americans to be able to vote. Secondly, President Trump’s environmental policies have not been fair to all Americans. His administration has insulted us by reversing many of the environmental compliance issues set in place by President Obama. Not only has President t Trump reversed these policies, he has cut the funding to the EPA which is the agency established to protect the environment. The current administration proposed a 25% cut in the $8.1 billion budget which will eliminate the agency’s environmental justice office. The environmental justice office works to close the gap in the disparity in pollution experienced by minorities, low income communities and wealthier white neighborhoods. Again, this is not what civil rights is about. Finally, the President and his administration have taken great care in cutting the budget for education. Trump’s first full education budget proposed huge cuts in public schools. The administration has planned to cut $10.6 billion from federal education initiatives. These cuts include grants for higher education. Again, the education issue has been one at the root of the civil rights fight. The President continues to support candidates in his own party who have also fought against civil rights. The President has endorsed Roy Moore who said the last time America was great was before the civil war. It amazes me that the President thought enough to go to the museum. Did he learn anything from his visit? Did he go with an open mind and a real appreciation for the reason we celebrate these brave Americans? Actions speak louder than words and his actions tell us loud and clear that he has no regard of civil rights.